People are taking notice of Virginia&apos;s Blue Ridge as America&apos;s East Coast Mountain Biking Capital. 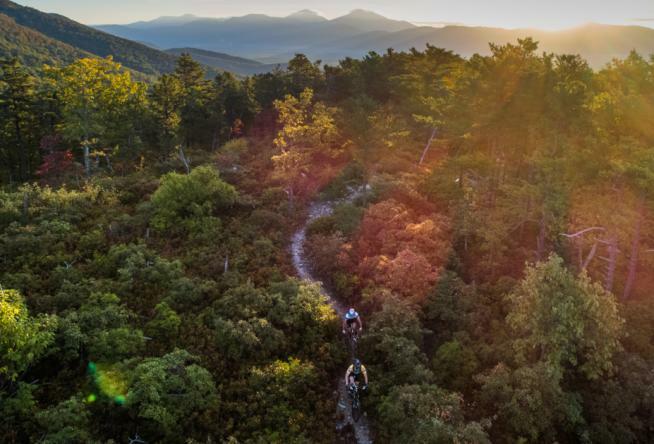 With the region&apos;s recent accomplishment of being named the International Mountain Bicycling Association&apos;s first Silver-Level Ride Center on the East Coast, the Roanoke Valley in Virginia&apos;s Blue Ridge is becoming a must-visit spot for mountain biking enthusiasts around the country. Virginia&apos;s Blue Ridge is featured throughout the September 2018 issue of Blue Ridge Outdoors Magazine, including in a story titled "Ride Centers: The Region&apos;s Best Biking Meccas." The article offers some insight into what it takes to become an IMBA Ride Center and showcases some of the destinations in the eastern half of the country that have earned the prestigious Ride Center status. It also highlights the strong community support of the local cycling community and enthusiasm that helped develop the trails, culture and infrastructure necessary to become the East Coast&apos;s first Silver-Level Ride Center. The web version of the article is available for reading on the Blue Ridge Outdoors website.